The 12 bar blues is one of the most common chord progressions used in the music world. It may seem like it would become boring quickly but it doesn’t. Things like groove, key, tempo and how to start and stop a song gives plenty of variety to the listener. There are however a few 12 bar blues variations that I feel are good to know. These will add a few more options when you play. 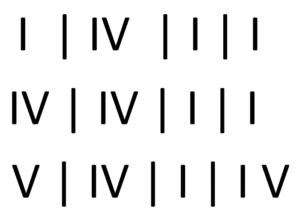 I will use the roman numeral notation for the chord progression to make it key agnostic. A quick change means that you go to the IV-chord already in bar 2, the rest is just the same as the standard 12 bar blues. The quick change introduces a bit more movement in the chord structure and is one of the more common 12 bar blues variations. An example of a song using it is “Before you accuse me”. I like this variation and it is well worth practicing jamming over it because you will probably run into it. Outline of the 12 bar blues with a quick change. 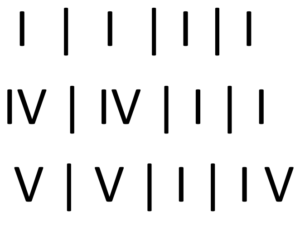 12 bar blues with a long V-chord may actually be a variation that is older than what we consider the standard form today. In this variation you stay on the V-chord also in the tenth bar. This form is used in the verses by Chuck Berry for “Johnny B Goode”. This is not a very common variation today but just for that reason it can be cool to use it sometime. It is also a great opportunity to show off your V-chord skills. 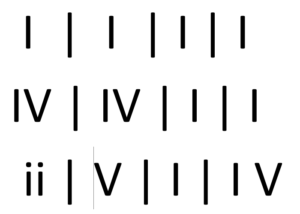 Outline of the 12 bar blues with a long V-chord. This change replaces the V-IV-I of the standard 12-bar blues. It has a bit of a more jazzy feel to it. You might be intimidated by the minor chord it introduces but it is not that difficult to handle. For G-major the ii-chord is Am which consits of A C E and G so two of the chord tones are already in the blues scale and E is easily accessible on a C-harp in 2nd position. An example of a song using this variation is Rory Gallagher’s “When my baby she left me”. These variations don’t have to be used in isolation you can combine the quick change with either the long V-chord or the ii-V-I change. This way you can put more 12 bar blues variations under your belt. Sonny Boy Willimanson II’s “Born Blind” uses both a quick change and a ii-V-I change, one of my favorite songs. It is great fun to play. Now it’s time for you to try. I have put together three jamtracks of the variations in different styles for you to use when practicing.